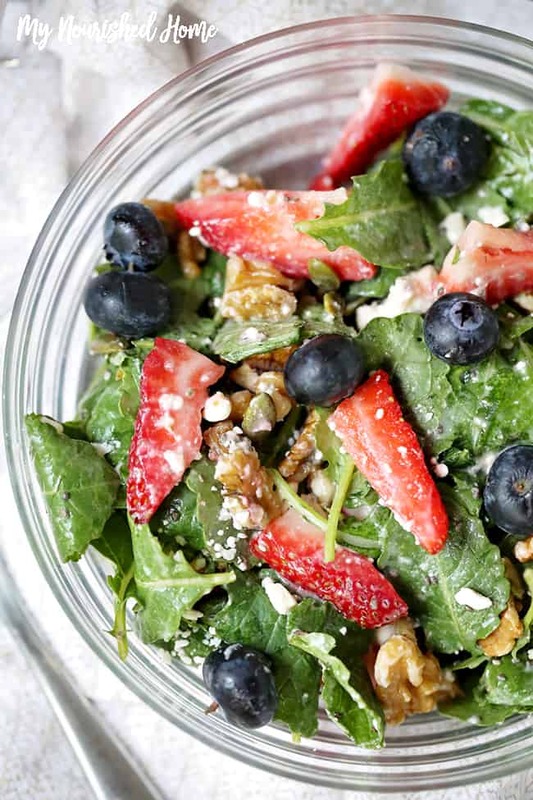 This Easy Kale Salad Recipe with apple vinaigrette is perfect when berries are in season. But even when they are out of season, we just switch up the fruit for something else. In the fall, the berries become apples and pears. 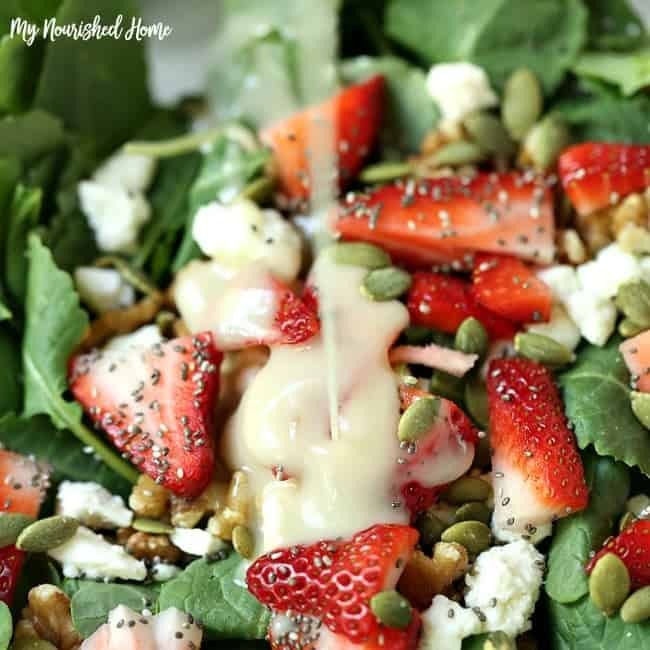 It is so tasty and so good for you, we really never take this salad out of our dinner rotation! Sweet strawberries are coming in season now and as soon as I see them in the grocery store, I pick up as many as I can fit in my grocery cart. We all love berries around here – and if the container ever opens, it is not going back into the fridge. Believe it or not, I have to ration my kids (and husband!) to one carton of strawberries a day or they will all open their own package and eat them the first day they come home. So if I actually want to serve this salad for dinner, I have to hide berries in the back of the refrigerator. 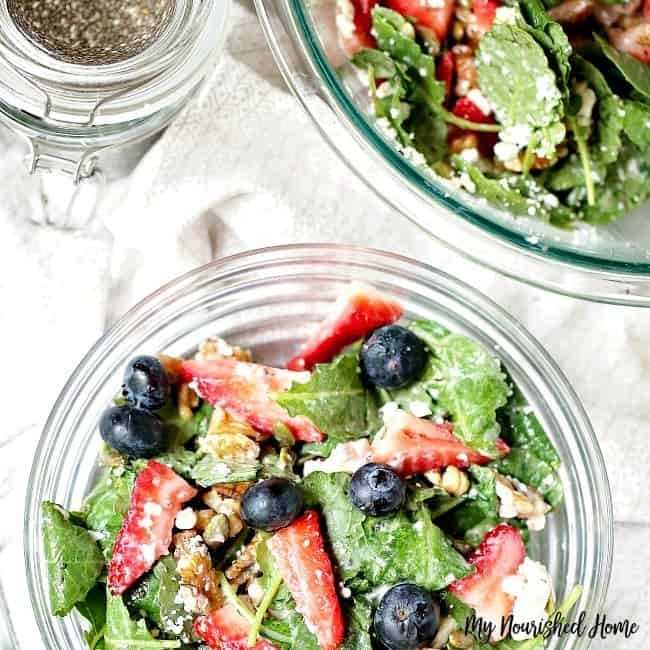 If I didn’t, I would never have a chance to make this quick kale salad with strawberries, feta, and other goodies. Knowing that I can open the refrigerator and grab ingredients for this baby kale salad recipe is important to me. I want to know that, even on super busy nights, I can offer my family a side dish that they will love. And if I ever want to get my youngest kids to eat their leafy greens covering them in strawberries is a good way to go! If you have young kids like I do and want them to eat kale, I suggest starting with baby kale since it is milder. During the heat of summer, I have often served quick kale salad as a main dish. You can easily top with baked chicken or add a healthy quick flatbread and perhaps a plate of cheeses to finish out the meal. 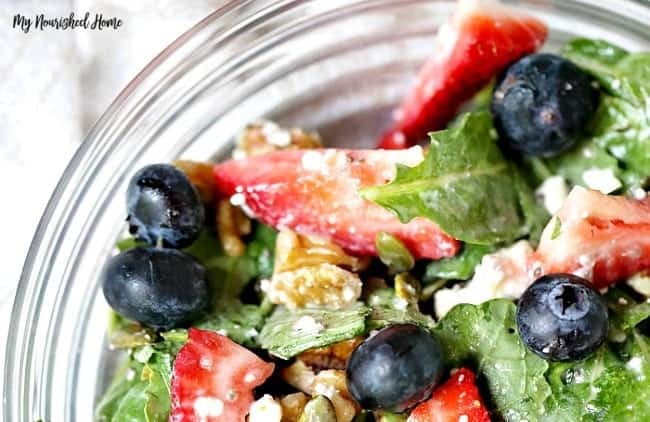 This easy kale salad recipe is so versatile. If you don’t have strawberries, you can substitute blueberries – or if your kids beat you to the strawberries and you only have a few left, use both. (Ahem, kids… hands off.) When berries are out of season, we often eat it with apples or pears. No walnuts in your pantry? How about almond slices or pecans? Don’t like feta? How about goat cheese… or even blue cheese! Looking for more ways to eat kale? 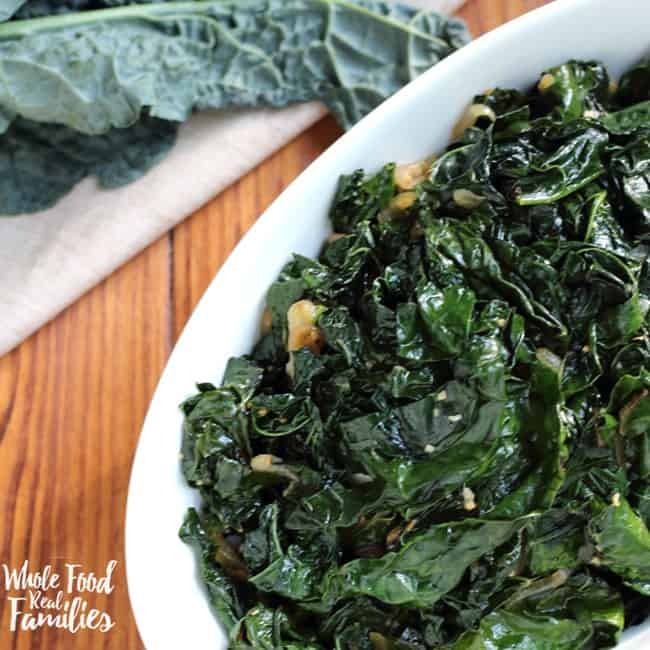 This Sauteed Kale is has been the number one recipe on this site for 3 years! With good reason, it is delicious and so easy! If you are looking for more great salads, check out these! 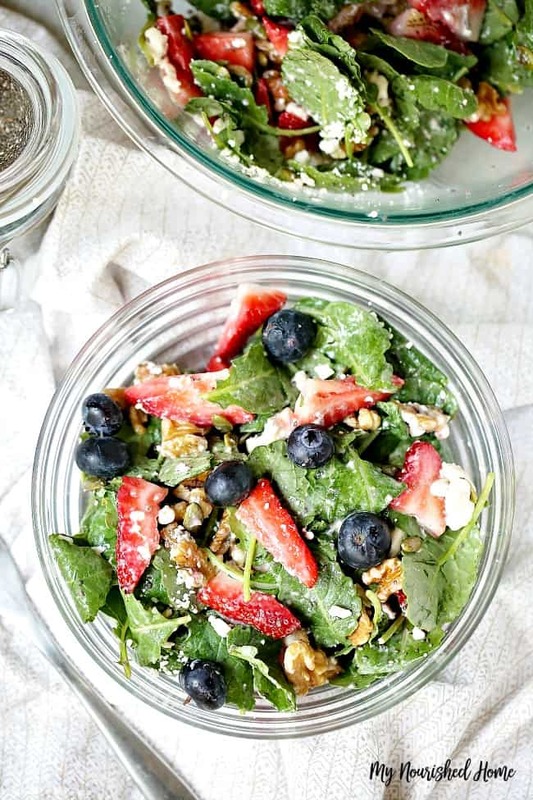 This easy kale salad has a tangy apple vinaigrette and is topped with strawberries, walnuts, and feta. Serving size depends if you are serving it as a side or main dish. Combine all ingredients except for dressing in a large bowl, toss lightly together. Drizzle with dressing, and toss again.